I said I would be back with some coordinating info on the Portfolios that have been running on the 7gypsies blog this past week. We love this product and have used it several times in classes. So over the next few days I will be blogging about ways we have used the portfolios and show you some examples of ways to make the product unique. Just a side note: The portfolio comes in 3 sizes and you can find them here (if you order make sure you look at the sizes because the pictures are not to scale). I will show you the finished portfolio and then I'll show you how to make it. It takes very little paper, in fact almost scraps and 2 pieces of 12 x 12 cardstock. I used a naked medium portfolio for this one (more ideas for this size found on the 7g blog). Which means it is gray stock and needs to be covered in paper or at least in my mind it does. The medium portfolio also comes in black and red (but the inside is still gray stock). 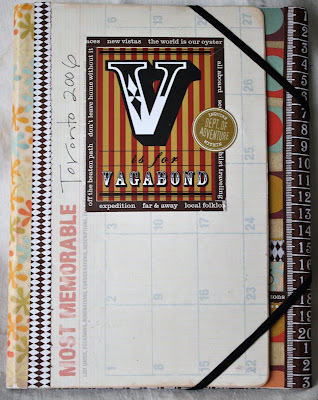 I used the 7g Vagabond sticker (still one of my all time favorites) to make a travel book for a trip my husband and I took to Toronto. When you open the portfolio on the left side (which is the back of the cover) I made a pocket for extra photos. 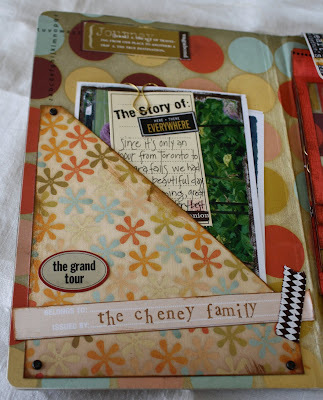 The center of the portfolio has 7 pieces of cardstock that flip up to reveal journaling and photos. I only used the most important pictures to tell certain stories. That's why there are pictures of Lays potato chips and none of Niagara Falls. When I look back at the book I still laugh at the funny stories I wrote right after coming home (and NO regrets about what I left out!). I have also learned in traveling to many foreign places that when you see something that is unusual or foreign to you, take a picture. Because the longer you are there, the less unusual things become. Hence, why I have pictures of garbage containers in Brazil, portable BBQ's in South Africa and Lay's Ketchup potato chips in Canada. The story of the "ZEN" hotel we stayed in. I have never paid so much for such an uncomfortable bed. The Eaton Centre and the Bata Shoe museum. It was hard to gather my thoughts about these place so I used signs in the store window and quotes I found later that seemed to apply. Again, very little paper, a rubbing and stickers. No pictures here just the story of Poutine (which we had never heard of before this trip). I altered the definition for Poutine to make it al little more personal. This is the page about the Ketchup, Smokey Bacon and Dill Pickle potato chips (they also had Curry flavor). The man in the mini market thought I was a little nuts taking pictures of his potato chip rack. Foreign grocery stores are some of my favorite places to take pictures on vacation. Many things are the same but there are some glaring differences. Like in Australia where they have a whole section called "tasty" cheese. I always thought all cheese was tasty! Or in Brazil where Halls cough drops are sold right at the check to buy like candy. So you can see, very little paper, mostly cardstock and a few pictures and journaling. All the rubbings throughout the whole project came from this rubbing sheet-7g Graphique. Start with TWO pieces of 12 x 12 cardstock. Cut down the center so you have FOUR 6 x 12" pieces. Cut each 6 x 12" piece individually. The first cut is at 4 1/2". So you end up with a 4 1/2 x 6" piece and 7 1/2 x 6" piece, set aside. The second 6 x 12" piece is cut at 5", leaving you with a 5 x 6" piece and a 7 x 6" piece, set aside. The third 6 x 12" piece is cut at 5 1/2", leaving you with a 5 1/2 x 6" piece and a 6 1/2" piece, set aside. The last 6 x 12" piece is cut at 6", leaving you with two 6 x 6" squares. One of the 6 x 6" squares is for the flip book. The other 6 x 6 piece is the pocket. For the pocket, make a mark 1/2" in from the left side at the top and 1 1/2" up on the right side. Using a ruler, draw a line between the marks. The small triangle is a scrap. I covered the pocket with patterned paper and attached to the flap with a bit of glue and brads. NOTE: You have to attach the pocket before you put the paper on the cover or the brads will show. Gather up all the piece you cut in order. They should all be 6" tall. Once you have them in order you will need to score the cardstock to make sure it folds open to see the inside easily. Score cardstock 3/4" from the top of each card. You can use a bone folder, a scoring tool, an old stylus (I think I bought it some time in the 80's) it still works like a charm. Punch two holes at the top, 4" apart with the small hole on the Crop-a-dile. Thread a 4" elastic (another of my favorite products) to secure the stack together. You can thread buttons, fabric, beads, etc onto the elastic as you wish. Once the cover is complete, position pages of the book into the portfolio. Mark holes with a pencil. Remove pages and punch with a long reach tool like a Big Bite. I used my old Making Memories hole tool (I don't know the proper name) that you have to hammer on the end to make the hole. It works fine. Okay, now you are ready to make your own! In Iowa, you can typically find cough drops at the checkout with the candy as well. Another wonderful tutorial! Thank you for the details! This is a great project...and I love your idea about photographing the "odd" food finds! She's too modest to say so, but I pretty much think she's a genius. She doesn't want to play golf with me but then again I'm not into paper and fabric.